Keep up to date on all the news about GlassRoots pending move! ​ I was listening to the radio on my drive in today and heard an interesting commercial. The announcer asked who would win a bicycle race, a child or last year’s Tour de France winner. The point of the commercial was to talk about how the ‘vehicle’ matters in the race, perhaps more than the person. If a child was riding a well-engineered racing bike, and the champ a tricycle, there’s a good chance that the child could win! GlassRoots Campaign 2020 is all about building a well designed vehicle so that our students have the best possible chance to win their race. The upgrades we’re making to our studios in terms of equipment and studio sizes, and the new spaces we’ll be introducing – the galleries, smart classroom, Makers’ Space, Scientific Glassblowing Shop, photo studio and even our packing and mailing room – have each been carefully planned to give our students the optimum vehicle to advance their futures. Those of you who have already donated have joined us on this exciting journey. But, we’re building a big vehicle, and need some more riders. As the move gets closer, our budget gets more precise. We’re so close to having every dollar we need to fully fund our move, outfit the new space, close out past debt, and create a reserve fund. Your gifts at glassroots.org/campaign-2020 or by check or transfer of stock will bring our campaign to a most successful conclusion. Please make a generous gift today. Students benefit from the time they’re here at GlassRoots. We ask you to make their experiences possible through your gifts. 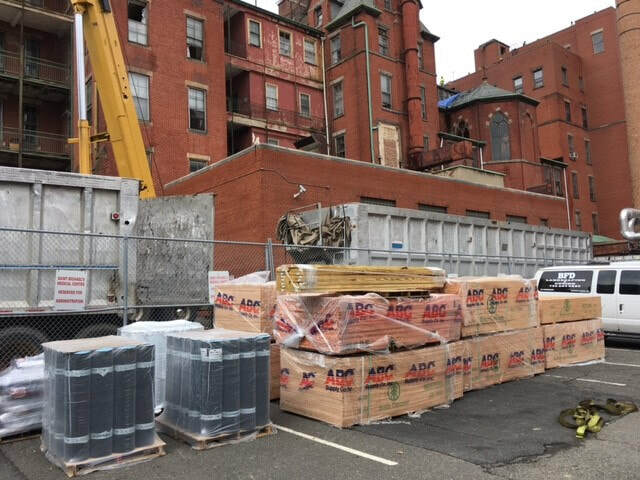 ​GlassRoots team has been working closely with the owners of the new Newark Arts Commons at the site of the old St. Michael's Hospital through demolition, structural work, asbestos and environmental remediation, permitting and design. It’s been a haul, but the ownership team has now hired a general contractor to take on the building portion, and we expect that the fit out of our space will begin within weeks of this newsletter! If all goes as planned, and we think it will, GlassRoots will be in its new home to celebrate the New Year! Our internal team is placing orders for new equipment for our glass shops, and we’ve received a generous donation of matching office chairs and desks to furnish our offices. We had a great conversation with new leadership at the Newark Museum to confirm our planned partnership to enhance our education programs with a Newark Museum Gallery at GlassRoots, and we’ve even started to talk with vendors about items for our gift shop! We'll have exciting news about our opening Gallery exhibition and a special piece of art, which will enhance our space, but we have to keep somethings for our next update! GlassRoots ignites and builds the creative and economic vitality of greater Newark, with a focus on under-served youth and young adults, through the transformative power of the glass art experience. This statement has guided our site selection and building plans. Throughout our process, we’ve considered how this space will serve our mission, our students, our community. The answer? GlassRoots has always been in the business of transformation. We continue to do that work. ​December 2018 Update - We're Happily Burning the Note! Willie Blaylock of City National Bank accepts the payoff check from our CEO Barbara Heisler. As part of a generous Campaign 20/20 gift, a donor earmarked dollars to retire the debt GlassRoots incurred building out the Hot Shop here at 10 Bleeker Street nearly 11 years ago! Can you imagine GlassRoots without a Hot Shop? Neither can we, but GlassRoots' Hot Shop is the newest of our three studios! Today, December 19, 2018, our exciting news is that GlassRoots is now debt free and ready to enter our new space in the healthiest financial position! Our goal, with Campaign 20/20, is to incur no debt in the build-out of our space at the Newark Arts Commons. With your gifts and support, we think that is not only possible, but probable! ​We are so grateful for all of you! And now, we are truly building an organization for the future! October 2018 Update - Recognizing our (S)heros! In October, GlassRoots had the pleasure to announce that two major spaces at the new GlassRoots' home at Newark Arts Commons will be named for our founders! ​Barbara McFadyen Nicholson, Jan Nicholson, and Kathryn Markel announced the naming of the Kettenring Learning and Conference Center and the Dena and Ralph Lowenbach Gallery at a small gathering of original board members and supporters of GlassRoots. Inspired by a glassblowing program for at-risk youth in Tacoma, Washington, Pat Kettenring, GlassRoots Founding Executive Director, brought together a dedicated group of artists, glass collectors, educators and professionals in Newark in 1999 with the vision of offering glassmaking and business skills workshops to youth ages 10 to 17. A Board of Trustees was formed, and the planning for our organization was underway. In January 2001, programming began at a satellite location at the Newark Boys and Girls Club. 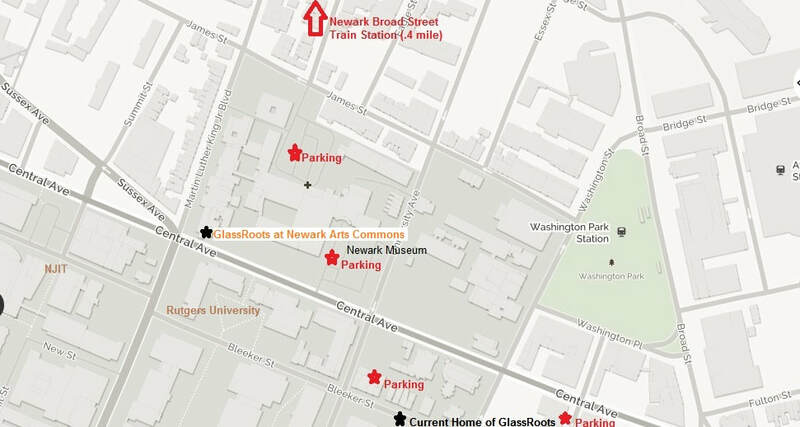 GlassRoots received 501(c)(3) status in August 2001 and later that year GlassRoots leased its current home at 10 Bleeker Street, a store front in downtown Newark, and began offering flameworking classes at this location. Soon after, glass fusing and mosaics were added to the curriculum, and six years later, a glass blowing studio was added. Jan and Barbara told the story of the trust and belief their father, William Nicholson, had in Pat Kettenring's vision, when he made the initial $100,000 gift that enabled Pat to open GlassRoots. Kathryn Markel reminded us that, at every step of the way, Dena and Ralph Lowenbach worked side-by-side with Pat to bring her vision to life. As our Founding Board Member, Dena continues to guide, coach, and inspire each and every staff and board member with her commitment to GlassRoots. Year after year, we at GlassRoots have seen the power of art to change young lives. Now we have a great opportunity to do so much more - to expand our space, our programs, our impact and our community of creativity. In late spring of 2019, GlassRoots will move into the Newark Arts Commons – a historic renovation that reimagines the beautiful but neglected St. Michael’s Hospital on Central Avenue in Newark as a creative arts center with GlassRoots as the anchor tenant. GlassRoots new home – all 20,000 square feet – will serve the growing number of students from grade school through college who want to visit and learn, as well as adults who want to expand their creative experiences. State-of-the-art Hot, Cold and Flat Shops, a dedicated Flameworking Studio, and Kiln, Mold and Sandblasting Studios are all facilities, which will promote creative entrepreneurship and ingenuity. The new Prudential Scientific Glass Workshop will bring industry back to Newark and create employment opportunities for graduates. We invite you to join us in honoring Pat, Dena and Ralph, by making a tribute gift in their names to the GlassRoots Capital Campaign 2020, which is focused on raising private and public support for our new facility, which will be a portal for increased creativity and economic vitality that can impact students from grade school to college; non-profits seeking events space; adults who yearn for artistic spaces and experiences; and the promotion of manufacturing in Newark. Your tribute gift to GlassRoots will be acknowledged with a card letting Pat or Dena and Ralph know a donation was made in their honor - and will be included on special glass plaques, which will be installed within each space. The amount of your gift is kept confidential. You can make your gift online or by check to GlassRoots, 10 Bleeker Street, Newark, NJ 07102. To make a gift of stock, learn more about the GlassRoots Campaign 2020 or to confidentially discuss a multi-year pledge, please contact, Barbara Heisler, CEO, at 973.353.9555 or via email. De-construction and construction are moving forward in our space at the Newark Arts Commons, and we're so excited! Tours still underway, but now we're wearing hard hats! ​ For a better view, come take a tour! Email or call our CEO, Barbara Heisler to schedule a visit! Earlier this month we gathered together some educators, designers, architects, and artists to take a hard look at our floor plans and see if we were missing any opportunities. They found a few ways that we can make our space even better than we were planning! Here's our current drawing of the new space! The writing is a bit small, but we hope the images give you a sense of what's happening where! For a better view, come take a tour! Email or call our CEO, Barbara Heisler to schedule a visit! 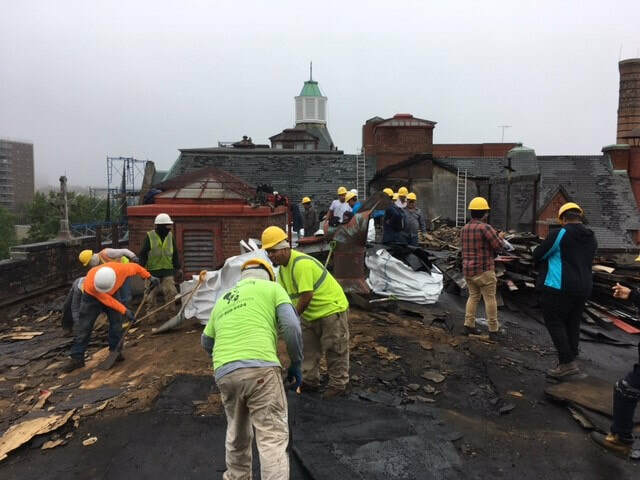 With gifts of $50,000 and $75,000 from Prudential Financial and the Victoria Foundation respectively, GlassRoots is approaching its goal of raising $2.1 million towards the historic 20/20 Capital Campaign to renovate the Old St. Michael’s building on Central Avenue in Newark. GlassRoots will occupy a dynamic 18,000+ square foot space and be an anchor tenant, collaborating with other educational and arts groups to catalyze the development of the entire neighborhood. Prudential Financial, a stalwart corporate benefactor, has dedicated its support to the GlassRoots Scientific Glass Program which will bring on-the-job training opportunities to Newark. The Victoria Foundation, a longtime supporter of GlassRoots’ mission, provided a capital grant to assist in underwriting the new facilities. GlassRoots’ 20/20 Capital Campaign is focused on raising private and public support for new facilities which will be a portal for increased creativity and economic vitality that can impact students from grade school to college; non-profits seeking events space; adults who yearn for artistic spaces and experiences; and the promotion of manufacturing in Newark. Imagine teen entrepreneurs presenting their art and defending business plans with passion and power. Envision a young woman gaining the confidence to launch her own bead business and achieve financial security. Feel the pride of an aspiring student earning a full scholarship to college because of the GlassRoots-Penland Fellowship. These stories and countless others like them are the faces of GlassRoots today. GlassRoots empowers thousands of youth to build the skills and confidence they need to succeed, and thousands of adults to stretch themselves and explore their creativity. Each individual who walks through our doors is deeply impacted by GlassRoots’ programs, unleashing their potential through the power of fire and glass. Did you miss our groundbreaking? Watch it here! Major Redevelopment to Take Place on MLK Blvd. The GlassRoots team is getting ready for the future! More to come in the coming months...stay tuned! Support Our Capital Campaign Today!